Arriving some hours later than planned and in the blackness of the Alpine night wasn’t the best of starts to a trip. Having to make first camp in the dark and barely managing to secure a hot meal at the local restaurant made for some worried and weary looking faces over an 11pm dinner. 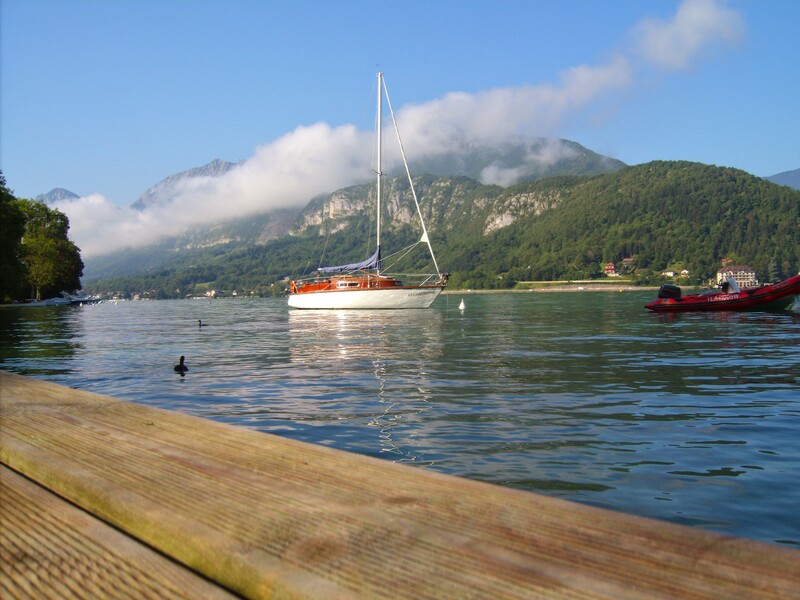 A decent nights sleep and the crisp morning light however brought with it a sense of calm and afforded us the stunning vista of the Lac du Annecy Rob had promised in return for pressing on and going the extra mile(s) on Day 1. It did indeed all make sense in the morning as he’d repeatedly assured us. The camp was beautiful for sure, but the bikes weren’t looking so good. On top of Rob’s evident electrical problem, we had a KTM dripping fuel out over the campsite (luckily Paul had noticed this in the middle of the night and had managed to get a bottle underneath to catch the drip) and a Yamaha Tenere with uncomfortably seizing brake calipers (an issue I’d known about before I’d left home but had naively considered something I could “manage” through the trip with silicon spray). More worrying though was the BMW’s chain, which was sagging limply off an extremely well worn looking rear sprocket. With several teeth having broken off during the epic Péage stint and the chain adjusters almost fully out it was easily apparent that it was far from likely to make it to the start of the Hard Alpi Rally in Italy, let alone endure the 24 hours of alpine trails of the Rally itself. Uncle Dave it seemed was the sole survivor from the first day’s Péage-induced onslaught of mechanical afflictions. 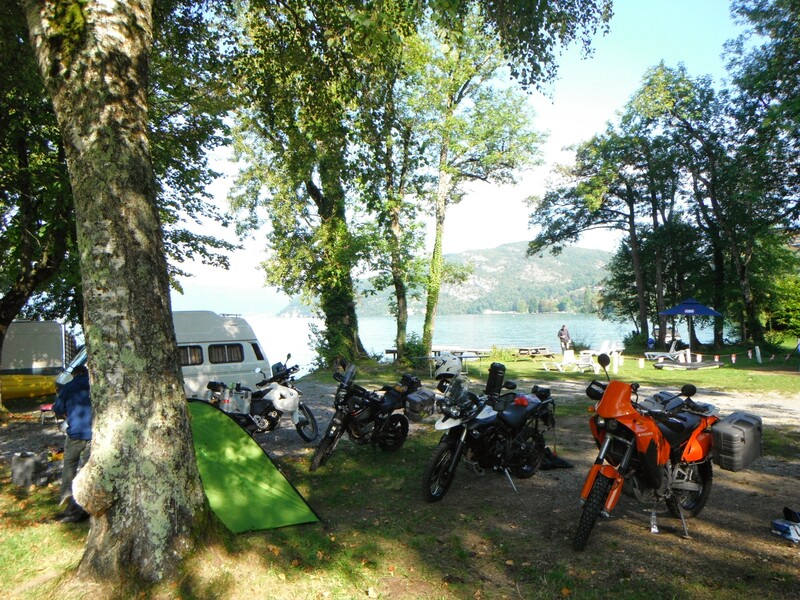 Fortunately though, pushing ever onwards beyond our usual first night lay over of Beaune had afforded us not just the beautiful waterside camp at the southern end of the Lac du Annecy, but also gave us, should we need it, a day in hand. So, rather than lament our inauspicious start we all mucked in with the tasks at hand. 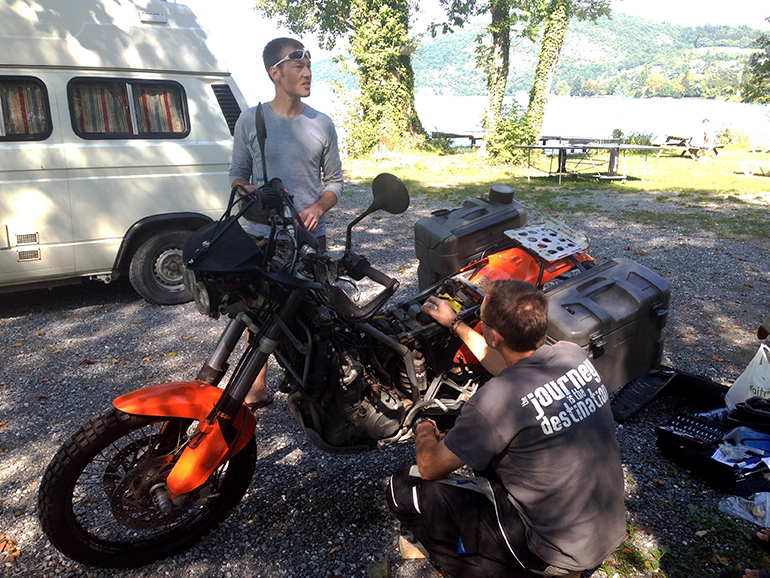 After some rocket-fuel coffees and whilst Rob went off back towards Annecy in search of a replacement chain and sprocket for his ailing BMW, we set to work stripping Paul’s KTM down to it’s bare nuts. 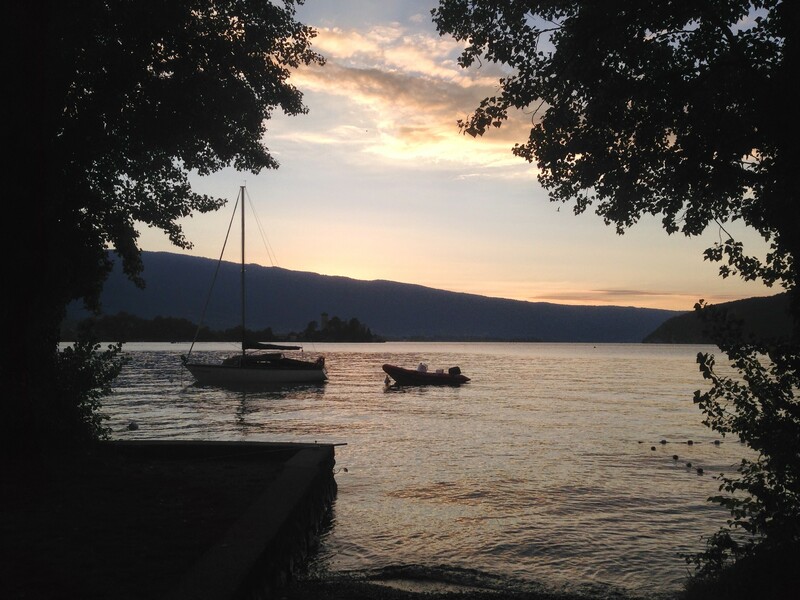 To give him his dues Paul had done his homework, he was 99% sure of what the problem was that was causing the fuel drip, he had brought the spare part with him along with a clear and detailed schematic and even instructions on how to perform the operation. With the bulky orange tank and faring sat supine, the float bowl was carefully removed from the bottom of the carburetor. Inside, the tiny brass valve was taken out and replaced with the new one. It looked like the seal had flattened out over time but it was hard to imagine something so small and insignificant could cause such a problem. The process was duly reversed and the KTM was methodically reassembled and the fuel leak cured – success! Flushed with the success of spannering, I removed my brake calipers from the disks yet again, popped the pads out and set to work getting the pistons moving in and out again with judicious amounts of silicon spray and elbow grease. With the KTM and the Ten back together there remained but one important job left for the team: PhysEds. In Rob’s absence we all went for an invigorating dip in the lake followed by lunch over the road. Later that afternoon, reunited with Rob, it turned out that his day hadn’t been quite as productive. After trawling around all of the local dealerships and bike shops in the area (being interrupted for 2 hours in his search by “siesta time”), of which we were assured that there are many, he had been unsuccessful in sourcing the necessary parts. Fortunately though and at the very end of the day Grand Prix Motos Annecy had managed to order a replacement chain and sprocket set although, surprisingly, it wasn’t something they had in stock. Assured that it would be at the dealership before 10am the following morning they even kindly offered the use of their workshop for Rob to fit the parts. As dusk fell over the lake and with the original Day 2 plan of moving on to Val d’Isere canned and a new, shorter route plotted over dinner for Day 3, this meant that Rob was going to have to head off solo first thing, replace the worn out parts on his Beemer then play catch up and it would be up to me to lead the group the following day. I’ll be the first to admit that the prospect of this left me with more than a little trepidation. My track record with leading and navigation has not exactly been what you might describe as stellar. The Hard Alpi Tour organisers had informed us early on that a Garmin product would be a prerequisite for the Rally and consequently I was running a satellite navigation system completely alien to me. On reflection I was more than aware that I should have found the time to familiarise myself with this new system at some point in the 6 months or more I’d owned it but prior to the trip I’d found myself distracted by other things. Hence why I’d also set off with seizing calipers amongst other failings in my preparation. What is it they say, “Fail to prepare and you should prepare to fail”? !